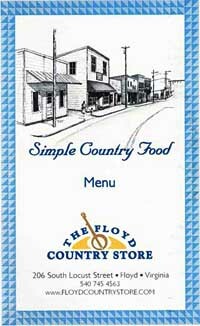 Woody Crenshaw, proprietor of the Floyd Country Store, has expanded the food offerings at the Country Store to include an entire selection of simple country foods. After sampling them thoroughly, I think he has raised the bar considerably on what I have long considered "comfort foods". 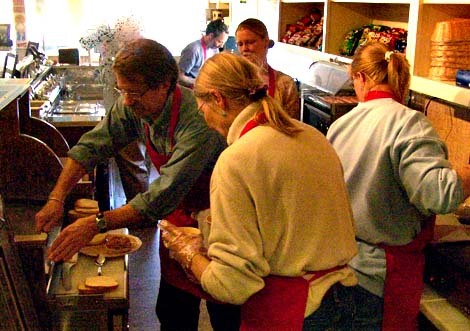 To launch the new venture, Woody invited a few people to a "taste test and kitchen exercise" to help test the menu and the food service before opening it to the public. The taste testers had a great time greeting old friends and ate everything in sight. 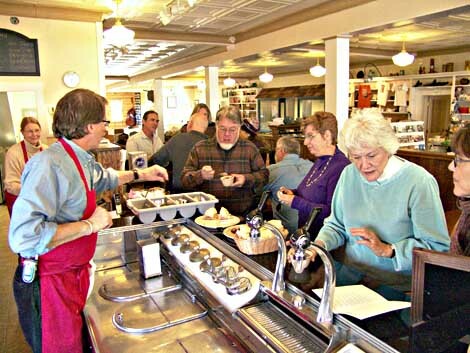 As you can see, Woody, Jackie and a host of helpers behind the counter were very busy keeping up with the eager taste testers. The menu contains a variety of simple foods prepared with great care. Woody and his wife Jackie have spared no pains to make every menu item memorable. If you can imagine grilled cheese sandwiches with bacon on home baked buttermilk bread, you can get an idea of the attention to detail that went into every menu item. The classic fifties-style sandwiches range from Bacon, Lettuce, and Tomato as shown at left to pimento cheese sandwiches to peanut butter and jelly sandwiches. Wonderful homemade soups included country style pinto beans served with chopped onions. Their new menu included such specialties as Chicago Style Hot Dogs with choice of toppings, Buffalo Sloppy Joes, and Classic Carolina Style pulled smoked pork barbecue. 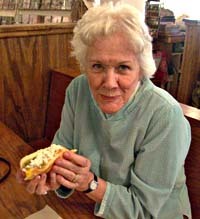 This hot dog connoisseur was highly appreciative of the five different toppings available on the hot dogs. Homemade desserts and five ice cream specialties like their Grasshopper provided the ultimate temptation. 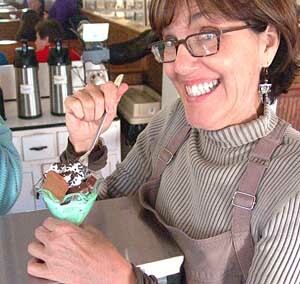 The Grasshopper contains mint chocolate ice cream, hot fudge sauce, crushed chocolate mint cookies and chocolate pieces. It was dubbed a raving success by the happy taste tester shown below. I went back today and had lunch at the Floyd Country Store and it was every bit as good as it was the night before. 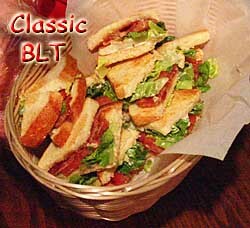 I enjoyed a Classic BLT and their homemade Cream of Tomato soup and used their high speed WiFi service to good advantage. Their menu offerings fit in a niche that was not being served by any of the other restaurants in town, inexpensive and carefully prepared comfort food in a casual atmosphere. You will have to try it to fully appreciate what Woody and Jackie have created here. I think this will be very successful. UPDATE: I didn’t make it clear that the Floyd Country Store is only open Friday and Saturday for now, but will be open all week after June 22nd. See you there! I have taken on an assignment to redesign the Floyd Country Store website so that it will fully reflect the expanded offerings of the Floyd Country Store. The website needs to provide answers for prospective visitors so that they know who is performing, what special events are planned, where to stay and what else to see while they are in town. There will also be more information on the musicians who perform at the store and how to contact them. One last bit of information: I heard that Woody plans to sell Carhartt Work Clothes in the retail shop inside the Floyd Country Store. That’s great news for Carhartt fans! Doug Thompson has more photos of the taste testing on his weblog. This entry was posted in Food and Drink, Seen around Floyd and tagged Buffalo, Carhartt, Chicago Hot Dogs, Classic BLT, comfort food, Floyd Counter Store, Grilled Cheese with bacon, simple country food, smoked pork barbecue, Woody Crenshaw. Bookmark the permalink. I’m really excited about the comeback of the soda fountain in Floyd. Is there a jukebox we can put quarters in? Do they even still make those? I doubt it. David, can you tell us, your readers, which music you like to listen to? Any Floyd musicians? Until I moved into the Blue Ridge Mountains, my favorite music was determined by where I lived and that was elsewhere. Now that I live here, there is no question that my favorite music is played by my friends and the musicians I have met here. You can see the articles I have written about music and musicians by entering music in the search window in the right column. This past Saturday Jackie worked with me to bring a wonderufl young band “Statement” to the Country Store to play during a tour visit by 34 4-H Youth Development Agents from all over the country (Florida to Alaska). The band was wonderful and so are the staff at the store. What an amazing gift to be able to share with these folks. It didn’t hurt that most of the band members are former Floyd 4-H’ers. Thank you to the Crenshaws for being so welcoming.